* 1963 Caracas, Venezuela. Curator based in the United States with over 25 years of experience. In 2004 he worked as a researcher at the Alejandro Otero Museum, Caracas, and between 2005 and 2012, he was director of Periférico Caracas / Contemporary Art, where he organized and curated more than 30 exhibitions. 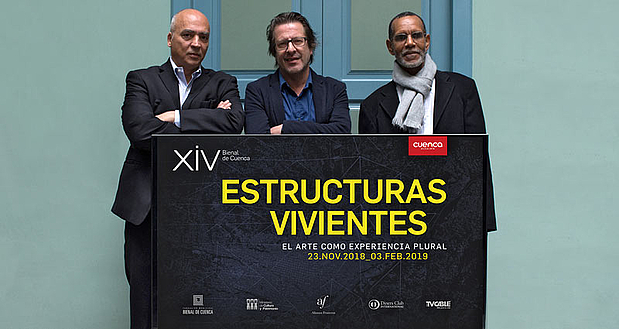 In 2002 and 2006, he directed the meeting about curatorship, sponsored by Fundación Mercantil, and between 2012 and 2015, he was director and curator of CIFO Art Foundation (Miami). In 2015, he curated the first solo exhibition of Eugenio Espinoza in a North American museum, Unruly Supports (1970-1980), at the Pérez Art Museum in Miami, and the exhibition Gego: Autobiography of a line, at the Dominique Lévy Gallery in New York. He was a member of the Advisory Committee and curator of the exhibition Kinaesthesia: Latin American and Kinetic Art (1954-1969), sponsored by the Getty Foundation Initiative Pacific Standard Time II, that took place in August 2107 at the Palm Springs Museum of Art. In 2016, he joined the jury of the Faena Prize for the Arts 2016-2017. He is currently preparing the first historical anthology of the German artist Lothar Baumgarten to be published this year. In February 2017, he curated the exhibition of Cayetano Ferrer. Topos at the Faena Center for the Arts in Buenos Aires. Between 1992 and 1995, he was an adviser of the Jacobo Borges Museum, Caracas. In 1998 he was co-curator of the Biennial Barro America held simultaneously at the Museum of Contemporary Art, Alejandro Otero Museum, and the Museum of Fine Arts in Caracas. He has advised on the formation of private collections devoted to contemporary art. Between 2000 and 2004, he was professor at the School of Design of the Faculty of Architecture of the University José María Vargas, Caracas. He has been a member of the editorial board of the Mexican magazine Polyester (1992-2000), and contributor of the magazines Art Nexus, Estilo, Atlántica. Revista de arte y pensamiento, Mousse, and Trans. In 2003, he presented along with Rafael Pereira, the exhibition Grupo Caracas / Ciudad sensorial at the Venice Biennale, a set of urban and architectural projects of Venezuelan architects working with critical areas of the city. * 1966 La Habana, Cuba. Professor, art critic, researcher and curator. He graduated from the Higher Institute of Art in Havana in 1990. Between 2002 and 2003, he achieved a Master of Museology at the University of Valladolid, Spain. He has worked as a researcher at the National Gallery of Art (1997-2003) and the Museum of Contemporary Art in Caracas (2004-2008). From 2008 to 2013, he was coordinator of exhibitions and curator of Periférico Caracas / Contemporary Art. He was manager of the Sala TAC, member of the curatorial team of Annex / Contemporary Art, and professor at the National Experimental University of the Arts. He is the author of the books A diestra y siniestra. Comentarios sobre arte y política (2005), Umbrales. Museo, curaduría, investigación (2013), and Panorámica. Arte Emergente en Venezuela, 2000-2012 (2014). He currently lives and works in Cuenca.